In this chapter we define and begin the analysis of paramodular vectors in representations of GSp(4, F) with trivial central character. In the first section we prove that paramodular vectors at different levels are linearly independent provided that the subspace of vectors fixed by Sp(4, F) is trivial. In the second section we introduce three level raising operators and prove that, except for one explicit non-generic Iwahori-spherical representation, these level raising operators are injective. Thus, except for this representation, the spaces of paramodular vectors in irreducible, admissible representations grow as the level increases. 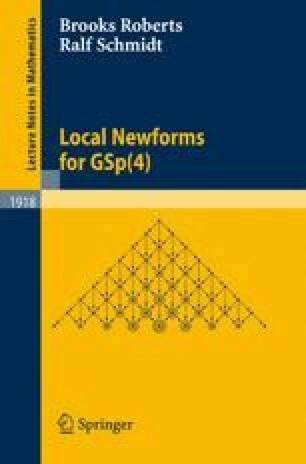 These level raising operators are integral to many of the proofs of the main results of this work, and are precisely the operators needed to obtain oldforms from newforms. The third section defines certain level lowering operators and gives explicit formulas. These level lowering operators are less important for our purposes than the level raising operators, but they appear in certain relations involving Hecke operators in Chap. 6.